NEW YORK Many homeowners who suffered losses because of flooding from superstorm Sandy are likely to find themselves out of luck. Standard homeowners policies don't cover flooding damage, and the vast majority of homeowners don't have flood insurance. Yet it's likely that many Northeasterners will purchase it in coming months, hoping they'll be covered the next time around, at a cost averaging around $600 a year. That's what happened after Hurricane Irene triggered flooding across 13 Eastern states in August 2011. 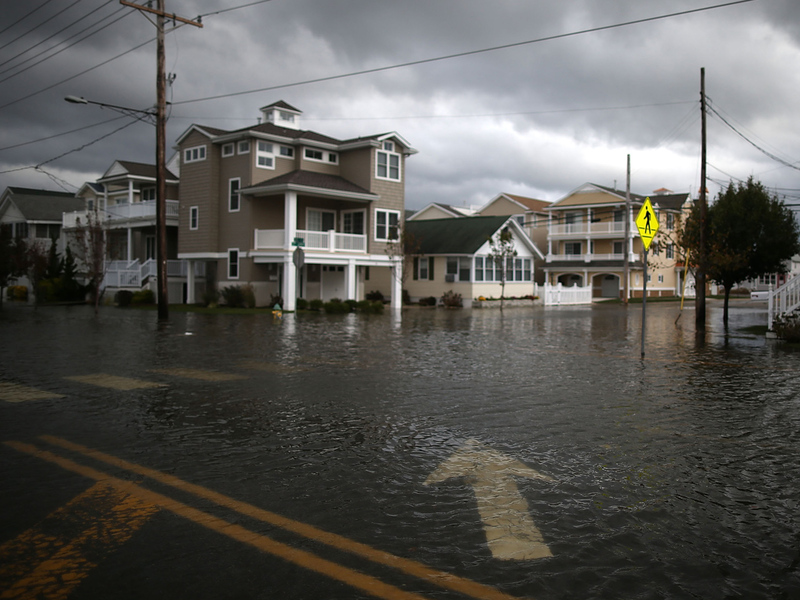 An annual survey by the insurance industry found that flood coverage in the Northeast rose to 14 percent of homeowners in May from 5 percent before Irene hit. Superstorm Sandy: Are you insured? The head of the industry's Insurance Information Institute attributes the jump to Irene, which hit many inland areas where flooding is historically uncommon. "Nothing sells flood insurance like a flood," says Robert Hartwig, the organization's president. "There will be many people in parts of the Northeast this week who will be very happy that they spent a few hundred dollars to buy flood insurance this year." Nearly all flood coverage is purchased through the government's National Flood Insurance Program. Homeowners, renters and business owners in participating communities are eligible to purchase federally backed policies, typically through private insurers that market the coverage. Information is available at www.FloodSmart.gov. Policies typically cost around $600 a year, but can start as low as $129 in low-risk areas, according to the Federal Emergency Management Agency, which administers the program. The average claim paid last year was more than $28,000. Coverage is provided for up to $250,000 for the home itself, and $100,000 for possessions. Homeowners who don't live in participating communities can buy private flood insurance, typically through so-called "excess coverage" to a homeowners policy. The federal program was created in 1968 because the cost of often-catastrophic flooding kept most insurers from writing flood policies. Even with the expanded coverage following Irene, the vast majority of Northeasterners responding to the latest industry survey do not have a flood policy. That means if they suffer flood-related damages from Sandy, they will likely have to foot the bill. That's because typical homeowners and renters policies don't cover flooding. It's also common for homeowners who don't live in high-risk locations, such as coastal areas and inland flood zones, to go without coverage. For those facing high risks, "Irene really was a warning shot to many people in the Northeast," Hartwig says. Though most homes are unlikely to ever be damaged by flooding, nearly 20 percent of flood claims come from areas considered to be at moderate to low risk for flooding, according to the National Flood Insurance Program. In high-risk zones, flood insurance is required to get a mortgage from federally regulated or insured lenders. "High risk" areas are those deemed to face a 26 percent chance of flooding at some point during the term of a 30-year mortgage a roughly 1 percent chance of flooding in a given year. It's unclear whether flood-related losses from Sandy will surpass the nearly $1.3 billion paid out through the federal program after Hurricane Irene. Flood claims came in from an area stretching from North Carolina to Vermont, with an average payout of $29,236. In terms of total flood losses, Irene was the fourth-costliest hurricane in the U.S., after Katrina in 2005, Ike in 2008 and Ivan in 2004. Whether water damage is covered by a homeowners policy depends on how it came about. Standard policies cover structural and water damage only in limited circumstances for example, when a falling tree knocks a hole in a roof or breaks a window, allowing rain to fall inside. But homeowners are generally not covered for damages to the home or personal belongings when damage results from rising water. That includes water that seeps up from saturated ground through a basement floor, and storm surges that flood homes near the coastline. Sandy triggered surges along much of the East Coast. Residents in many of those areas could be eligible for federal assistance. President Obama declared major disasters for New York and New Jersey. Affected residents could be eligible for grants for home repairs or low-cost loans to cover uninsured property losses. Nationwide, 13 percent of homeowners have flood insurance according to the industry's latest annual survey. That marks a decline from 14 percent a year ago. The expansion in coverage in the Northeast was offset by declining coverage in the Midwest, which fell to 6 percent from 13 percent; and in the West, which dropped to 6 percent from 12 percent. The highest regional coverage rate was in the South, at 21 percent. So far this year, the number of major floods has been below-average. Through September, the federal government had declared 15 major flood disasters, compared with 53 in all of 2011. Sandy was the only hurricane to make landfall in the U.S. this year, out of 10 total hurricanes in the Atlantic Ocean. The storm was downgraded from a hurricane to a post-tropical cyclone shortly after it reached New Jersey. AP Personal Finance Writer Mark Jewell contributed to this report.